Young music superstars Drake and Nicki Minaj debut as prehistoric elephants in “Ice Age 4: Continental Drift” where their characters are engulfed in the wake of global cataclysmic changes brought about by Scrat. 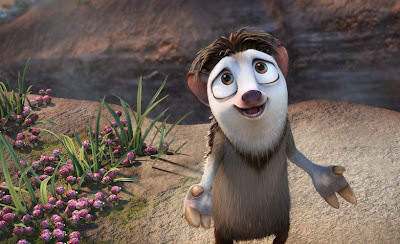 Scrat’s obsessively hilarious nutty pursuit of the cursed acorn brings waves of changes that trigger seas of adventure for Manny the mammoth (voiced by Ray Romano), Diego the tiger (Denis Leary) and Sid the sloth (John Leguizamo). Along with their latest adventure are Manny’s beloved wife Ellie (Queen Latifah) and their now teenage daughter Peaches (Keke Palmer of Disney’s comedy teen series “True Jackson VP”). Manny and the headstrong Peaches have been quarreling, a relatable issue to any parent or teen since Manny is the prototypical overprotective dad. Peaches’ biggest conflict with her dad stems from the increasing amount of time she’s spending with her teenage friends, especially Ethan, the famous Big Mammoth on Campus, voiced by hip hop sensation Drake. Meanwhile, Peaches’ romantic rival for Ethan’s affection is Steffie, one of the mammoth girls is voiced by rapper Nicki Minaj. Glee’s most followed cheerleader Heather Morris portrays another teen mammoth named Katie. “ICE AGE 4: CONTINENTAL DRIFT ” sails July 12 in theaters nationwide from 20th Century Fox to be distributed by Warner Bros. Below is the "We Are Family" music video from Drake and Nicki Minaj — the official soundtrack (OST) to the 2012 most anticipated animation movie "Ice Age 4: Continental Drift"! Enjoy!